Jill Hedgecock is an award-winning and internationally-published author. She is a regular contributor to The Diablo Gazette and her freelance articles have been featured on the front cover for three issues of this monthly newspaper in 2018 alone. She authors book review columns for both Books ‘N Pieces Magazine and The Diablo Gazette. She has been in a book club for approximately 20 years where she has gained valuable knowledge on what readers consider good literature. Her short stories, personal essays and nonfiction pieces have appeared in multiple anthologies, newspapers, and magazines. 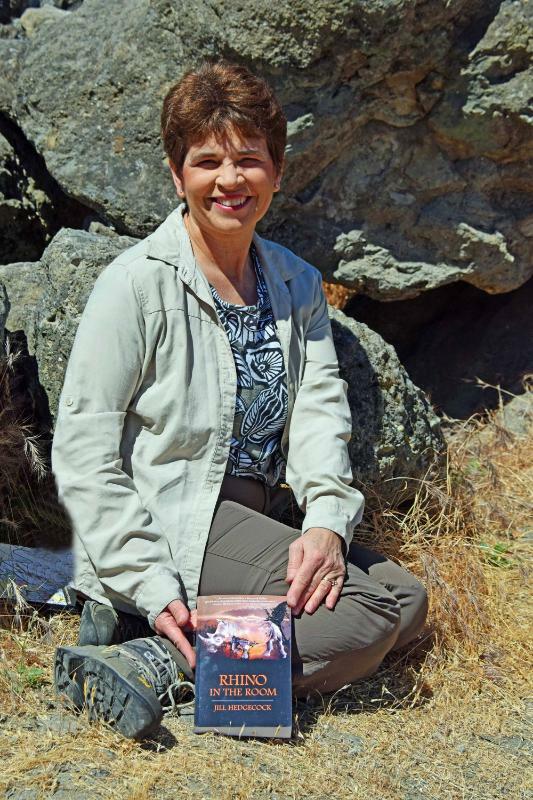 Jill serves as the Program Coordinator Mount Diablo branch of the California Writers Club (CWC) and was honored to receive the Distinguished Service Award from for a second time in 2018. She has judged the Young Writer’s contest sponsored by CWC for eight years and for the National Scholastic Art and Writing Awards for the last two years. Rhino in the Room is her debut novel. The last place seventeen-year-old fashionista, Claire, wants to go is on a South African safari with her father. Her discovering of her dad’s extramarital affair has unleashed a tidal wave of anger towards him. Plus, her best friend’s struggles with malaria have induced a phobia of this mosquito-borne disease, which has her double-dosing on anti-malaria pills, a medicine that causes hallucinations. Claire’s safari experience improves after meeting Junior, a handsome young guide. The animal encounters soon inspire her to design a safari line of clothing. Then Claire and Jackson are granted an extraordinary opportunity to see the last two surviving western black rhinos. After Claire breaks an important game drive rule, she and her Dad are separated from their vehicle and their tour group. Lost and on foot in the dark, surrounded by fire, and pursued by a vengeful poacher, Claire and Jackson trail the black rhino as their best option to be rescued by with park authorities. Can Claire and her dad overcome their broken relationship in order to save themselves and the last two black rhinos from extinction? If you have never been on an African safari, this is as vicariously close as you will get to doing so. If you have, you will recognize the vividly-described sights, smells, sounds and elemental rush of an intense wilderness experience. Rhino in the Room is far more profound than a fast-paced thriller. It’s the story of vanishing wildlife that’s happening on our watch. Hedgecock has a mastery of evocative language and seamlessly guides the reader through the details of both an African safari adventure, as well as the poaching that takes place. The reader experiences everything in such detail that the experience becomes real. 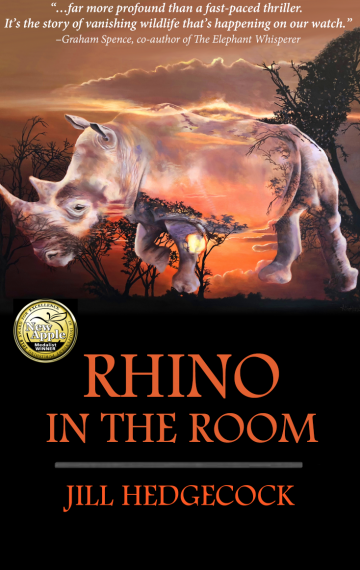 The plight of the rhinos is made quite clear and it is difficult not to feel helpless as the novel develops. Rhino eases you slowly into the action, but then holds you tight until the highly charged finish, leaving the reader exhausted and satisfied. Jill Hedgecock writes with passion about the near extinction of the black rhino and the human predators who stalk it, and she tells an exciting story for YA readers in the process.